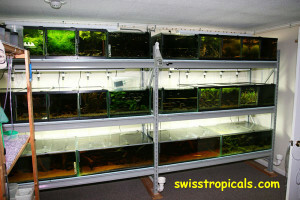 Part of the old tank system shortly after the move in May 2006. 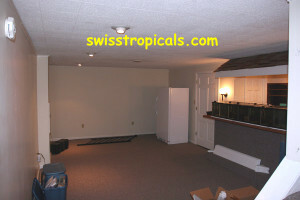 The other end of the basement still empty but ready to build. 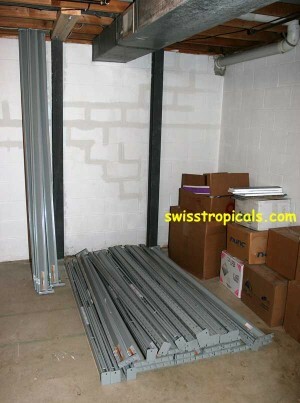 The heavy duty racks before assembly. 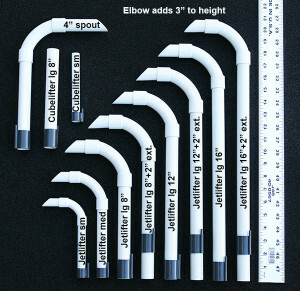 They come from Global Industrial. 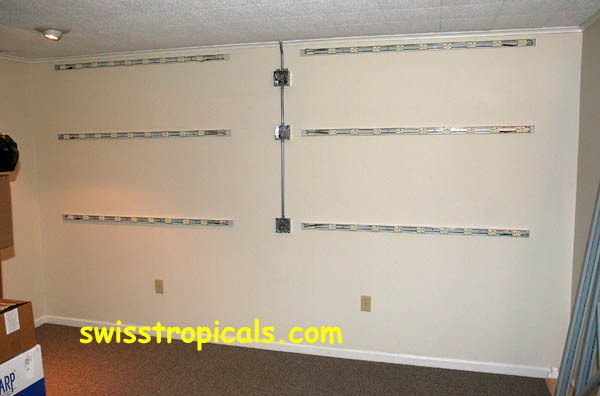 GFCI protected power strips professionally installed for easy access. Each block of three has its own 20-amp circuit. 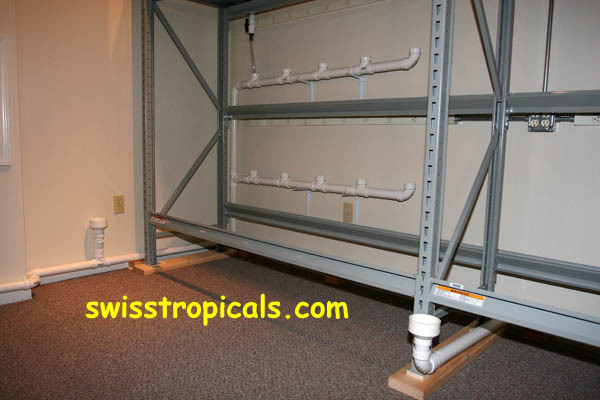 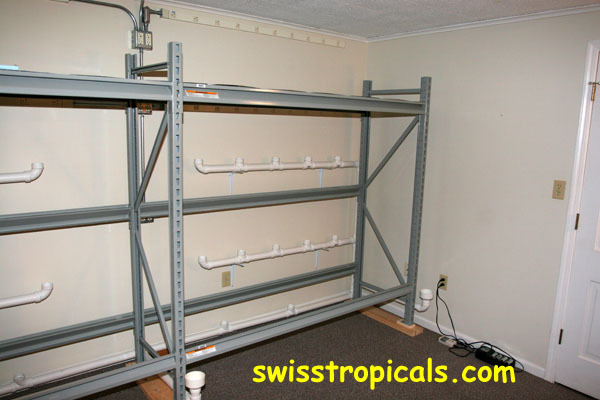 2x 6-foot rack setup with drains and power strips on the back wall. The drains are 1.5-inch PVC pipes that go around the room and end in a floor drain. 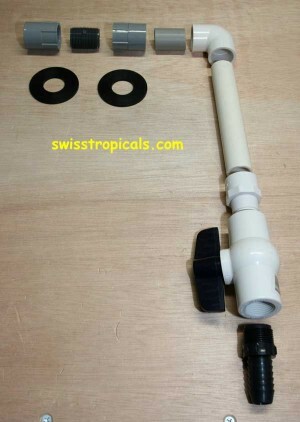 The parts needed for my outflows and bulkheads are available at your hardware store. 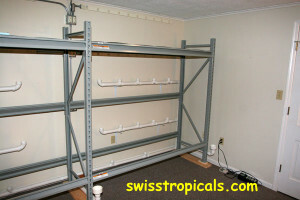 The assembled piece ready for installation. 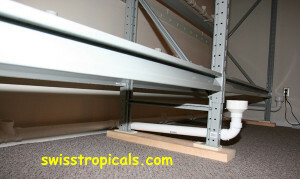 After installation on the shelf. Water changes made a breeze. 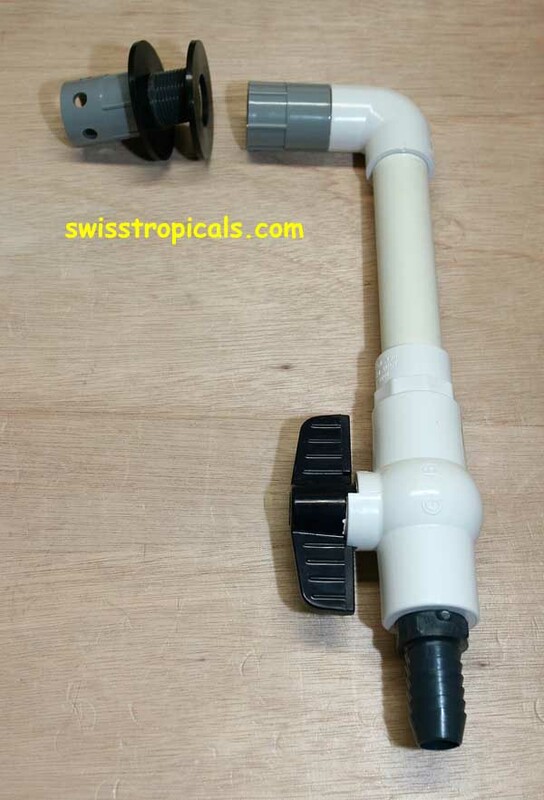 Additional funnel drains for easy siphoning. A 3/4-inch air supply line goes around the room fitted with brass needle valves. 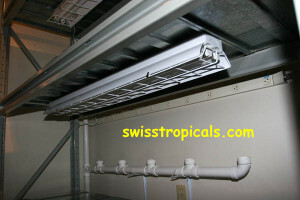 Lights are installed below the metal decking of the shelves. 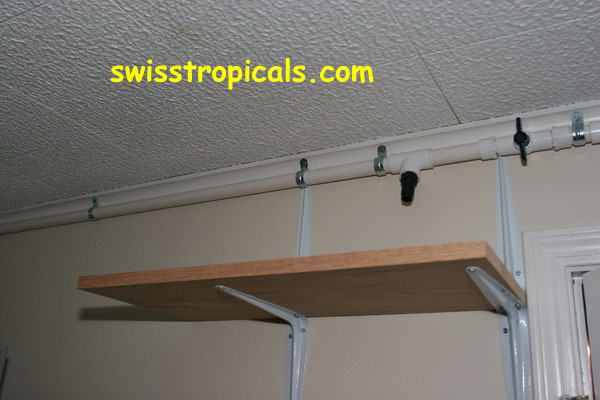 Heavy duty air pump shelf. 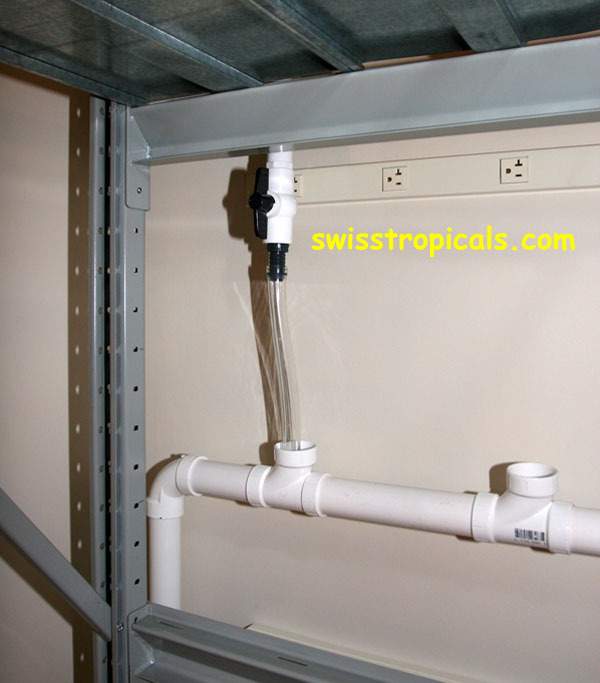 The PVC pipe distributes the air around the room in a loop. 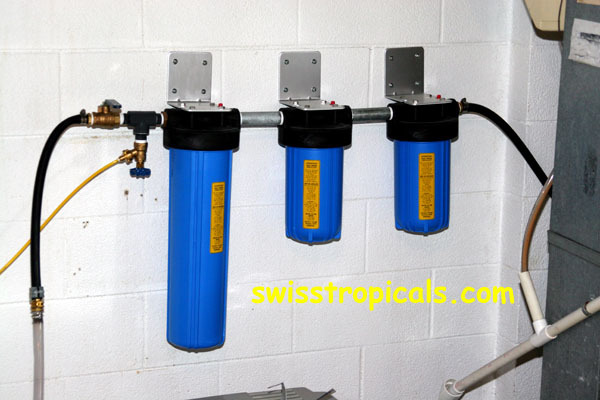 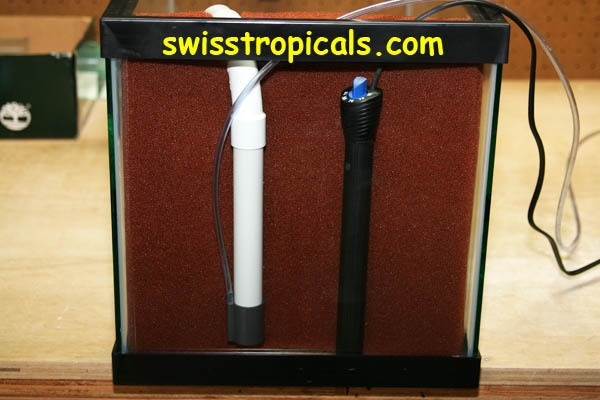 My water supply goes through two sediment (20- and 5-micron) and a 2-micron carbon filter. 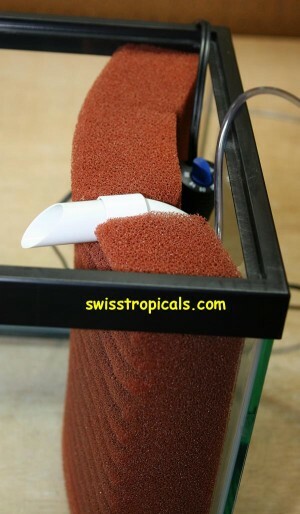 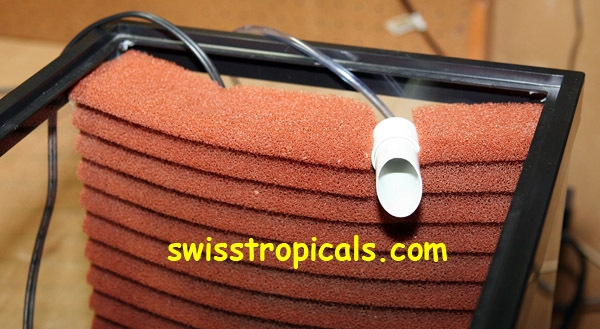 Mattenfilter in a 15-gal tank with red waffle Poret® foam. 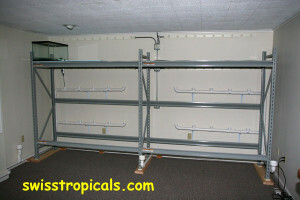 The bulkhead (not shown), heater, and large jetlifter (below) are all hidden behind it. The driving force behind my Mattenfilters are Jetlifters™, here in April 2012, the Poret® sheets are now >6 years old! 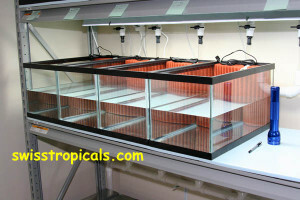 Tanks are set on foam insulation sheets. Note the easy access to the valves of the row above. 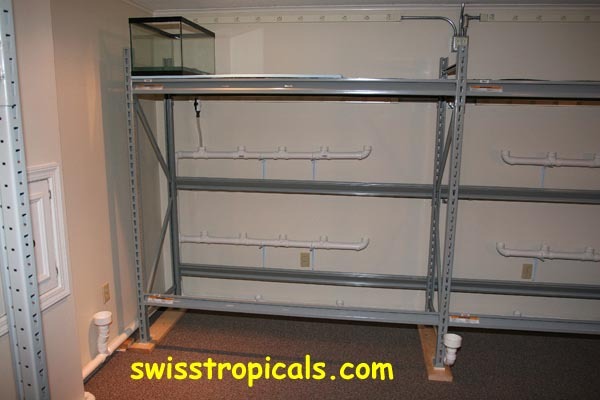 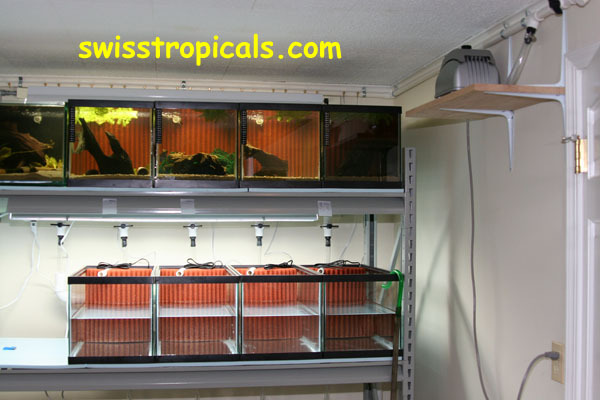 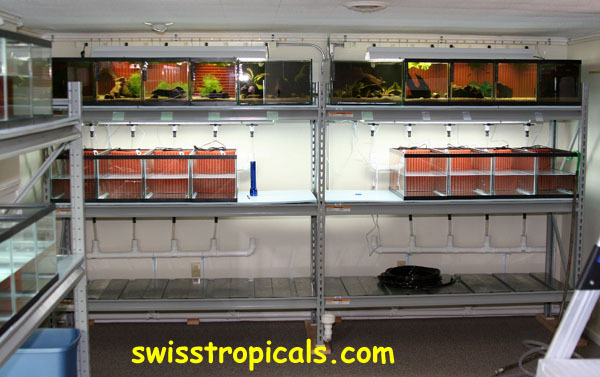 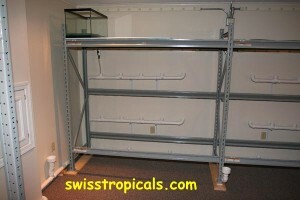 An 8-foot rack with 12x 15-gal tanks already installed. 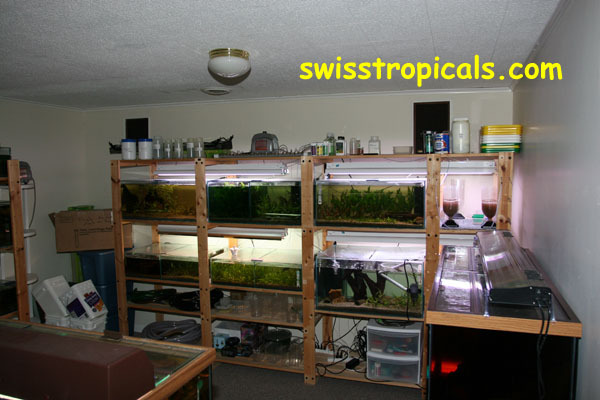 A 6-foot section with 4x 15-gal and a custom 30-gal that I call a “double-wide”. About half finished with some tanks in operation in November 2006. 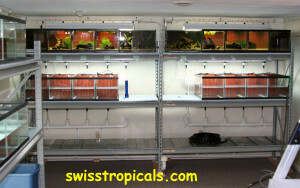 8-ft shelf after 5 years of operation in August 2011. 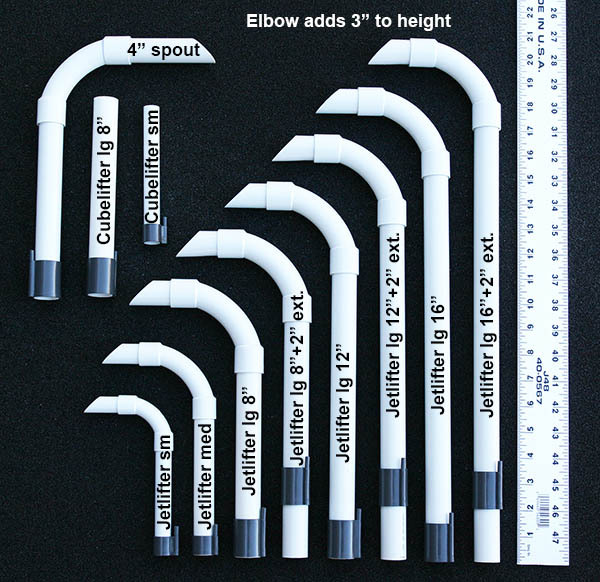 I still use the same filter sheets from 2006 but replaced the PVC-lift-tubes with Jetlifters™ which tripled the water flow to >100 gal/h. Note the flow of the large Jetlifter™ in the right tank! 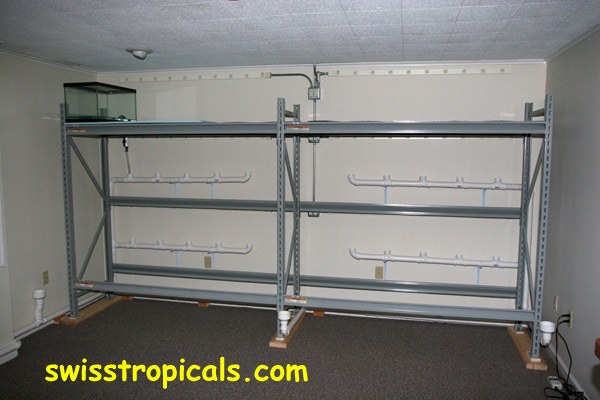 The two 6-ft shelves. 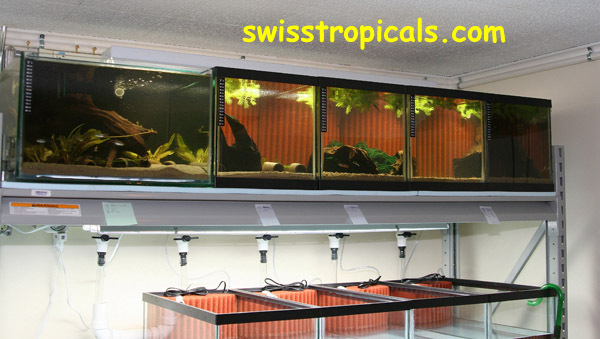 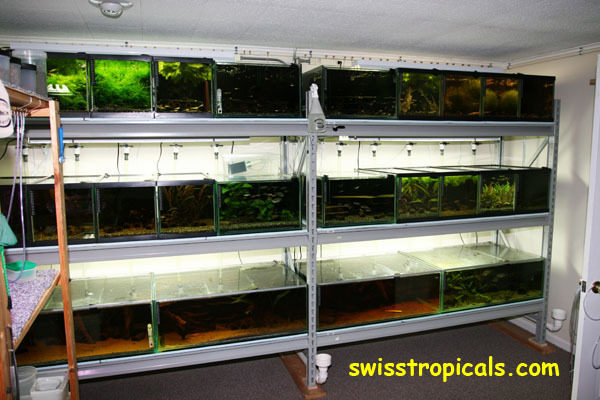 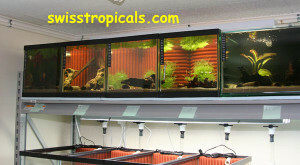 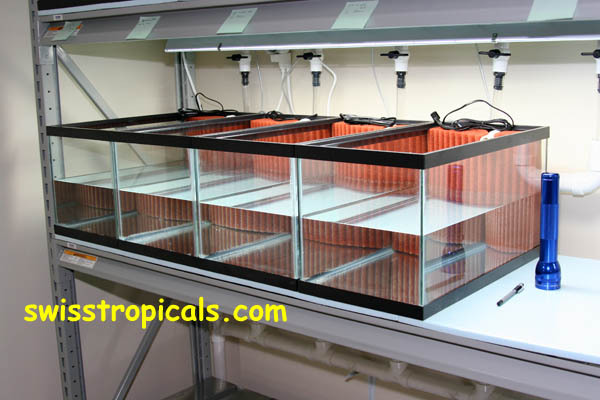 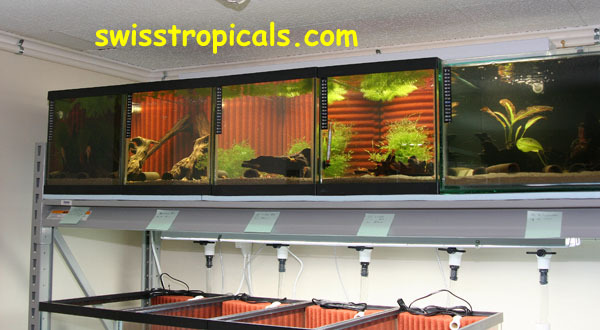 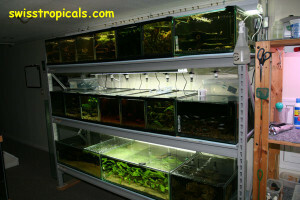 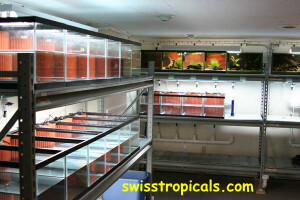 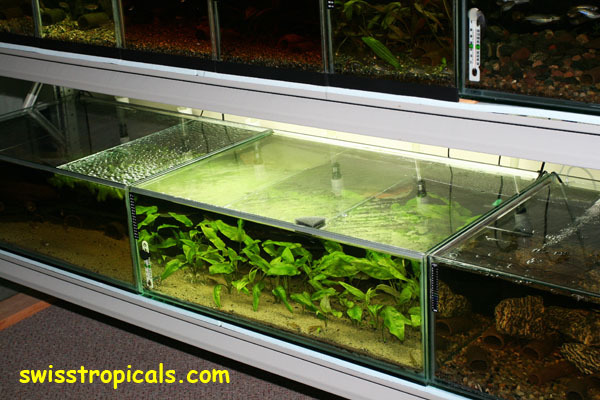 Most tanks have plants and substrate. 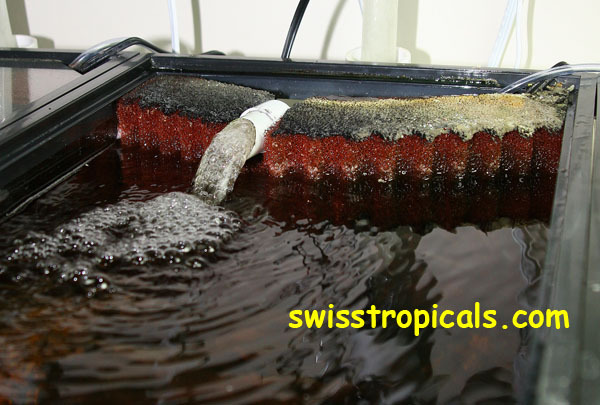 The dark water is caused by lots of driftwood. 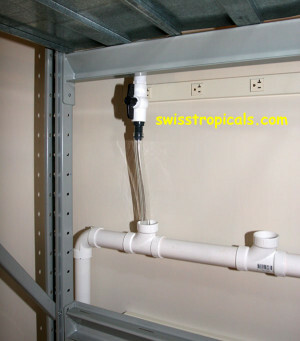 My wet bar! 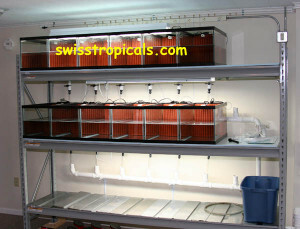 The breeding setup with 10 gal tanks, all with Cubefilters for quick retasking. 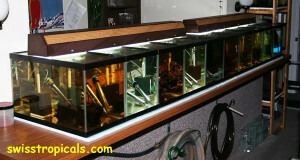 Final state in 2012: 63 tanks operational. 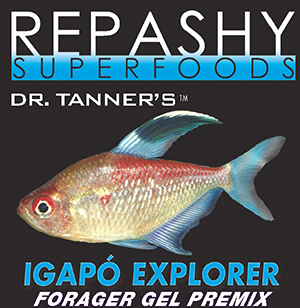 Then, we took it all apart… to start a new hatchery in Rochester, MN.